During this tumultuous time of history spanning from AD 30-1799, the Church explodes throughout the world, uncharted regions are explored, distant cultures are united, and religious wars burst into flame. Through it all, students will see God moving behind the scenes to accomplish His purposes, inviting kings and peasants alike into His kingdom. 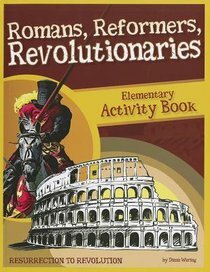 About "Activity Book (Romans, Reformers, Revolutionaries Series)"
Diana Waring is one of the most respected historians in the Christian education field today. In this great new series, Waring captures students' attention and helps to facilitate an appreciation for history and cultivates a desire for lifelong learning.